First up, just a quick message to my local readers in and around NSW. Be careful and stay safe with all these huge bush fires. For those in other countries, here in Australia we have experienced an extremely hot and dry start to spring and there horrible wildfires that are burning across the state. I hate to think of what summer might bring. No onto nails. I'm trying to work on a happy balance between nail art and swatching, and I think I've discovered the solution. I do both! 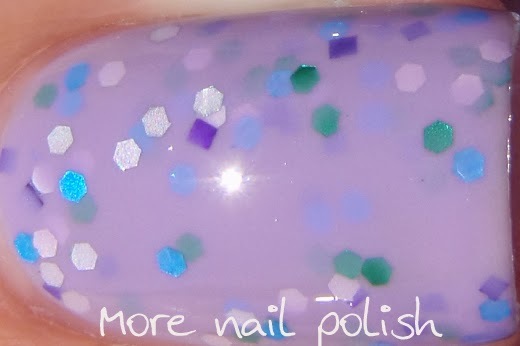 So for this post I have some nail art I created using one of the new Picture Polish Collaboration shades and then I have swatches of all the new collaboration shades. 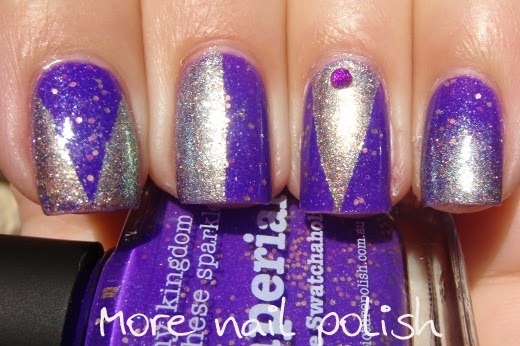 My nail art features new collaboration shade Imperial and a previous collaboration shade Majesty. With both these polishes, I felt I had very regal nails! I did some gradient nails and tape mani nails in various combos. Pairing these two polishes together just seem natural, even the description of Imperial describes it a a majestic purple! Now onto the new collaboration shades. I've said it before and I'll say it again, I think the concept of Collaboration shades is genius. I'm so proud that it's an Aussie brand that's really getting out there engaging with bloggers, creating such unique and interesting shades over and over again. 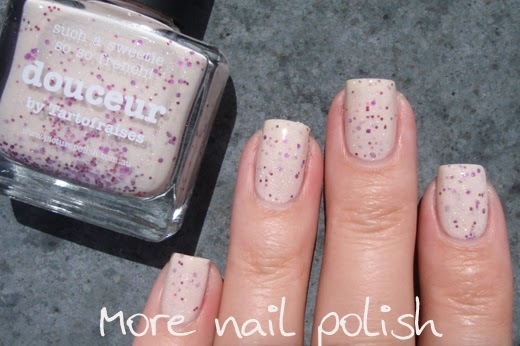 Douceur - a flesh coloured pink jelly, with multi-sized hex glitter in magenta and mulberry with a scattered holo shimmer. Created by french blog Tartofraises. So pretty in real life. 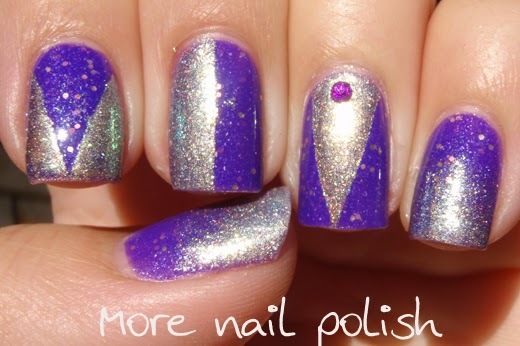 I love the base colour with the holo shimmer through it. 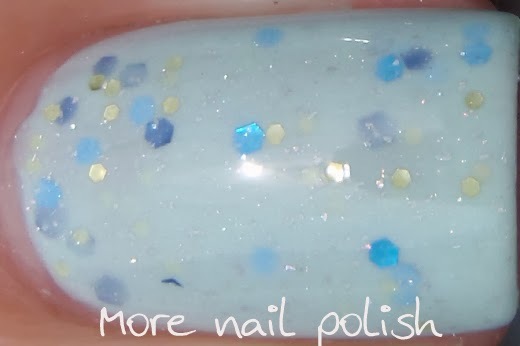 Geode - an egg shell blue with multi-sized hex glitter in royal blue, sea blue and gold dusted with the tiniest holographic shimmer! Created by Ami from Every Sensory. I love geodes, imagine finding a little egg shaped rock and cutting it open to find all those gorgeous crystals. I like the clever connection between the polish name and the bird egg blue colour. I also love the really subtle holo shimmer in the crelly base. 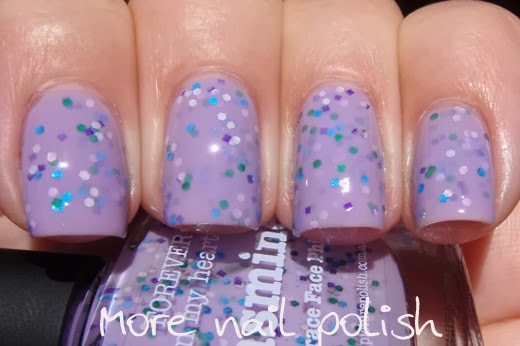 Jasmine - is a lavender creme full of hex glitters in green, blue, purple and silver created by Tracey from the TraceFace Files. 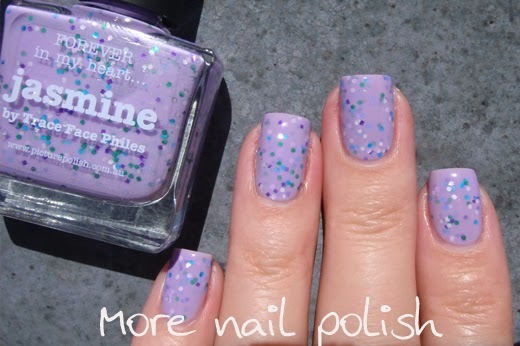 The swatch photos I saw from TraceFace Files makes this look much pinker, but I really love this lavender shade. I'll wear this shade a lot more than the pink shade I thought it was going to be. Very pretty. Siren song - a stunning combination of pastel mint green and silver particles melded together to form a metallic mesh shade that just glides on your nail with a totally sparkling finish! 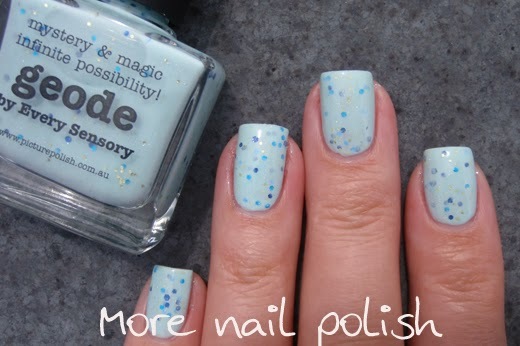 Created by Rebecca from Rebecca Likes Nails, I remember following Rebecca's blog a long time ago, shortly after she started blogging and I love the shade she created. 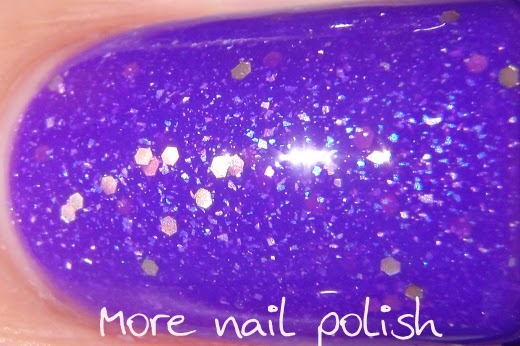 The ultra fine silver glitter in this creates the effect of wet sparkling polish, even when it's totally dry. It's also a really flattering shade of mint green and perfect for our spring weather. 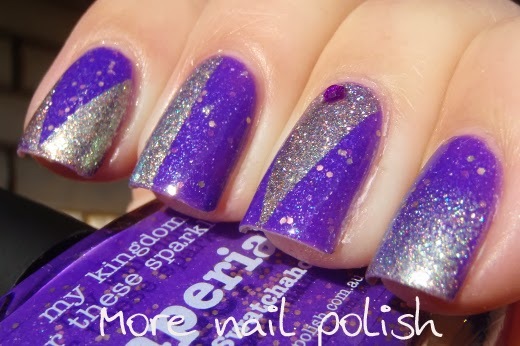 Imperial - a majestic purple with scattered holo, blue glass flecks and a smattering of small gold hex glitters for added royalty! 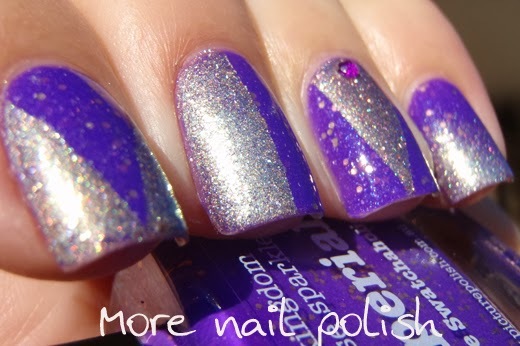 I have, like probably every other nail polish lover out there, got the biggest crush on Jeanette's swatch photos over at The Swatchaholic. Seriously, they are perfection! Her nails are perfect, her cuticles are perfect, her photos are perfect. 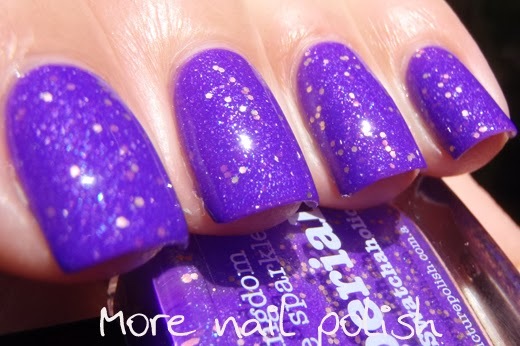 She should have created a polish called it perfect. Then again, regardless of it's name, Imperial is pretty much perfect too. 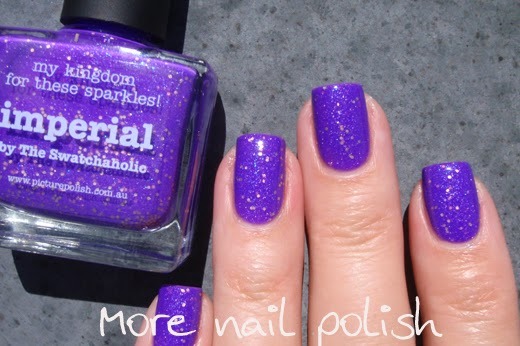 I thought the colour would be similar to Shy Violet, but Imperial is a much bluer purple. I have a big crush on this shade! Oooo, I like all of these quite a bit. I don't own any Picture Polish yet.